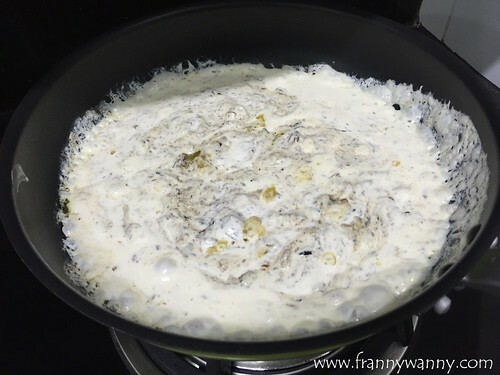 I know it has been a while since my last #FrannyCooks recipe and I'm really sorry about that! To say that this year has been busy and crazy is indeed an understatement. Actually our schedules just got so hectic starting the 2nd quarter of this year and it's just starting to ease off this month. There were just so many things happening all at the same time that at some point, both Paul and I felt like headless chickens running around as we're trying to get a lot of things done. During my recent visit home, I was so lucky to receive some bottles of Mega Creation Premium Sardines for me to try here in Singapore. You see, both Paul and I love bottled fish. Sardines, tuna, salmon, unagi, tuyo, you name it, we both love it! We always make it a point to stock our kitchen cabinet with at least four bottles of each as you'll never know when the craving strikes or when we just need to whip something up quickly. 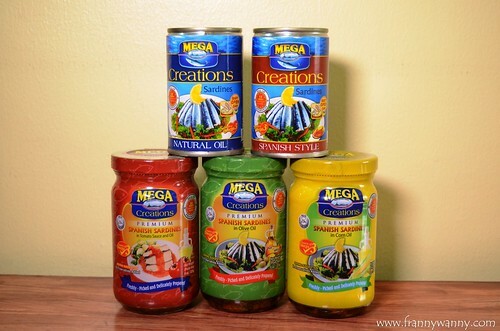 Mega Creation Premium Sardines has been a household name for decades and they're known to have the sardines in tomato sauce packed in small tin cans. I was quite impressed to see how they've upgraded and made these bottled versions giving it a more premium/gourmet feel. That said, as soon as I came back to Singapore, I set one night to try one of the bottled sardines. The only challenge is to be able to have everything done by the time Paul gets home from work and that means I only have 45 minutes to work my magic. Possible? You bet! - 4 cups of penne pasta, cook according to package. Keep the pasta water. 1) Saute garlic in olive oil until it gets slightly dark. Do not brown. 2) Add in the sardines and continue to saute. 3) Drizzle with lemon juice. 5) Season sauce with salt and pepper based on desired taste. 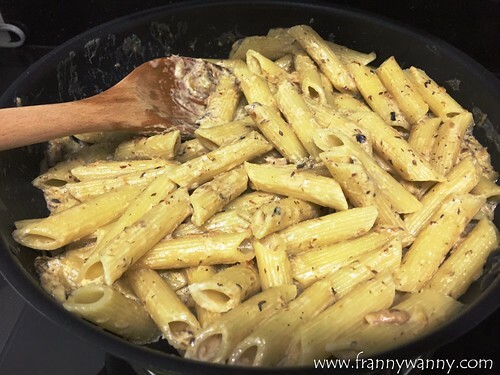 6) Add in the penne pasta and pour in a cup of pasta water. Mix evenly. 7) Let it simmer until it bubbles. Turn off from heat. 8) Sprinkle with crushed basil leaves and parmesan cheese before serving. 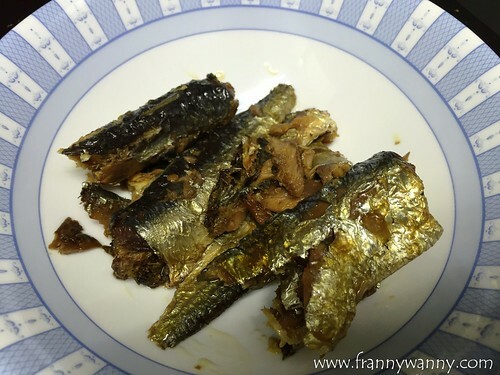 I have to say that I was really surprised at how yummy the sardines was. It was really flavorful and each piece was quite meaty. Having received a number of products for the pasta 9 years, there's a couple that we ended up loving and would buy on a regular basis. 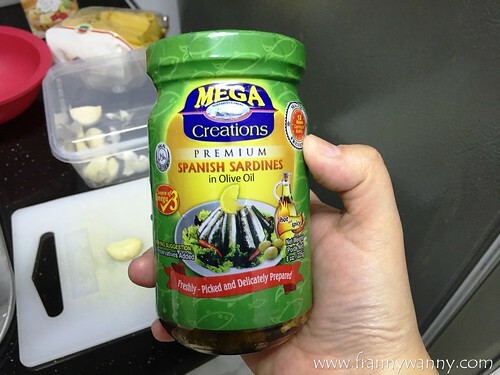 Looks like Mega Creations Sardines will be part of our Manila grocery haul from now on. Aside from this pasta, I was also able to try the Spanish Sardines in Tomato Sauce and Oil and it was the BOMB! I'm not kidding. The quality and flavour were a notch higher than your usual sardines in tomato sauce as it wasn't as tangy since the tomato sauce was mixed into the oil. I'm pretty sure that you'll be asking for more rice when you get to try this. I was just out of bread then but this would definitely do well in an open-faced sandwich. I can't wait to visit Manila soon for me to buy and re-stock our Mega Creations Premium Sardines stash here in the Lion City. Check them out on Facebook. wow i like it! coz I am a Mega Sardines lover..I always cook Sardines pasta sauce instead of meatsauce for my Family!yummy na healthy pa!! !